Prior to the revelation of The Urantia Book, little was known or understood about the purely human life of Jesus of Nazareth before his public life. - especially about his childhood and the family life that he enjoyed with Mary and Joseph There has long been speculation regarding the existence of siblings in Jesus' family, and in The Urantia Book, we learn that Jesus did indeed have younger siblings - eight of them, to be exact. They are, in birth order: James, Miriam, Joseph, Simon, Martha, Jude, Amos, and Ruth. Because of the death of Joseph, when Jesus was but a lad of 14, he naturally assumed his role as brother and father to his younger siblings, and there are many wonderful stories here regarding Jesus' parenting style. In the following passages from The Urantia Book, we learn about these important figures in Jesus' life, and Jesus' relationship to them. For the most complete understanding of Jesus and his family, click on the links to get the full story for each event cited. In this year, 2 B.C., a little more than one month before his fifth birthday anniversary, Jesus was made very happy by the coming of his sister Miriam, who was born on the night of July 11. During the evening of the following day Jesus had a long talk with his father concerning the manner in which various groups of living things are born into the world as separate individuals. While Jesus was most methodical and systematic in everything he did, there was also in all his administrative rulings a refreshing elasticity of interpretation and an individuality of adaptation that greatly impressed all the children with the spirit of justice which actuated their father- brother. He never arbitrarily disciplined his brothers and sisters, and such uniform fairness and personal consideration greatly endeared Jesus to all his family. Jesus' position was made more difficult because his mother and uncle, and even his younger brother James, all urged him to join the nationalist cause. All the better Jews of Nazareth had enlisted, and those young men who had not joined the movement would all enlist the moment Jesus changed his mind. He paid compliment to his mother and eldest brother for being willing to release him but reiterated that loyalty to a dead father forbade his leaving the family no matter how much money was forthcoming for their material support, making his never-to-be-forgotten statement that "money cannot love." In the course of this address Jesus made several veiled references to his "life mission" but explained that, regardless of whether or not it might be inconsistent with the military idea, it, along with everything else in his life, had been given up in order that he might be able to discharge faithfully his obligation to his family. Everyone in Nazareth well knew he was a good father to his family, and this was a matter so near the heart of every noble Jew that Jesus' plea found an appreciative response in the hearts of many of his hearers; and some of those who were not thus minded were disarmed by a speech made by James, which, while not on the program, was delivered at this time. That very day the chazan had rehearsed James in his speech, but that was their secret. In passing through Samaria, they saw many strange sights. On this journey they talked over many of their problems, personal, family, and national. James was a very religious type of lad, and while he did not fully agree with his mother regarding the little he knew of the plans concerning Jesus' lifework, he did look forward to the time when he would be able to assume responsibility for the family so that Jesus could begin his mission. He was very appreciative of Jesus' taking him up to the Passover, and they talked over the future more fully than ever before. Jesus did much thinking as they journeyed through Samaria, particularly at Bethel and when drinking from Jacob's Well. He and his brother discussed the traditions of Abraham, Isaac, and Jacob. He did much to prepare James for what he was about to witness at Jerusalem, thus seeking to lessen the shock such as he himself had experienced on his first visit to the temple. But James was not so sensitive to some of these sights. He commented on the perfunctory and heartless manner in which some of the priests performed their duties but on the whole greatly enjoyed his sojourn at Jerusalem. And there were still other reasons which made it wise, in the opinion of Jesus, for him to go back to Nazareth. When he returned to the repair shop, he did not again assume the personal direction of family affairs. He worked in association with James at the shop and as far as possible permitted him to continue oversight of the home. James's management of family expenditures and his administration of the home budget were undisturbed. And now things began to happen—marriage was in the air. James's success in gaining Jesus' assent to his marriage emboldened Miriam to approach her brother-father with her plans. Jacob, the younger stone mason, onetime self-appointed champion of Jesus, now business associate of James and Joseph, had long sought to gain Miriam's hand in marriage. After Miriam had laid her plans before Jesus, he directed that Jacob should come to him making formal request for her and promised his blessing for the marriage just as soon as she felt that Martha was competent to assume her duties as eldest daughter. James and his bride, Esta, moved into a neat little home on the west side of town, the gift of her father. While James continued his support of his mother's home, his quota was cut in half because of his marriage, and Joseph was formally installed by Jesus as head of the family. Jude was now very faithfully sending his share of funds home each month. The weddings of James and Miriam had a very beneficial influence on Jude, and when he left for the fishing grounds, the day after the double wedding, he assured Joseph that he could depend on him "to do my full duty, and more if it is needed." And he kept his promise. Miriam lived next door to Mary in the home of Jacob, Jacob the elder having been laid to rest with his fathers. Martha took Miriam's place in the home, and the new organization was working smoothly before the year ended. At Philadelphia Jesus and Simon became acquainted with a merchant from Damascus who developed such a great liking for the Nazareth couple that he insisted they stop with him at his Jerusalem headquarters. While Simon gave attendance at the temple, Jesus spent much of his time talking with this well-educated and much-traveled man of world affairs. The family finances were in the best condition since the disappearance of Joseph's estate. The final payments had been made on the caravan repair shop; they owed no man and for the first time in years had some funds ahead. This being true, and since he had taken his other brothers to Jerusalem for their first Passover ceremonies, Jesus decided to accompany Jude (who had just graduated from the synagogue school) on his first visit to the temple. Jesus endeavored to obtain either an immediate hearing for Jude or else his release in time for the Passover celebration that evening, but he failed in these attempts. Since the next day was a "holy convocation" in Jerusalem, even the Romans would not presume to hear charges against a Jew. Accordingly, Jude remained in confinement until the morning of the second day after his arrest, and Jesus stayed at the prison with him. They were not present in the temple at the ceremony of receiving the sons of the law into the full citizenship of Israel. Jude did not pass through this formal ceremony for several years, until he was next in Jerusalem at a Passover and in connection with his propaganda work in behalf of the Zealots, the patriotic organization to which he belonged and in which he was very active. The morning following their second day in prison Jesus appeared before the military magistrate in behalf of Jude. By making apologies for his brother's youth and by a further explanatory but judicious statement with reference to the provocative nature of the episode which had led up to the arrest of his brother, Jesus so handled the case that the magistrate expressed the opinion that the young Jew might have had some possible excuse for his violent outburst. After warning Jude not to allow himself again to be guilty of such rashness, he said to Jesus in dismissing them: "You had better keep your eye on the lad; he's liable to make a lot of trouble for all of you." And the Roman judge spoke the truth. Jude did make considerable trouble for Jesus, and always was the trouble of this same nature—clashes with the civil authorities because of his thoughtless and unwise patriotic outbursts. Jesus and Jude walked over to Bethany for the night, explaining why they had failed to keep their appointment for the Passover supper, and set out for Nazareth the following day. Jesus did not tell the family about his young brother's arrest at Jerusalem, but he had a long talk with Jude about this episode some three weeks after their return. After this talk with Jesus Jude himself told the family. He never forgot the patience and forbearance his brother-father manifested throughout the whole of this trying experience. Before Jesus took the twelve for a short sojourn in the vicinity of Caesarea Philippi, he arranged through the messengers of David to go over to Capernaum on Sunday, August 7, for the purpose of meeting his family. By prearrangement this visit was to occur at the Zebedee boatshop. David Zebedee had arranged with Jude, Jesus' brother, for the presence of the entire Nazareth family—Mary and all of Jesus' brothers and sisters—and Jesus went with Andrew and Peter to keep this appointment. It was certainly the intention of Mary and the children to keep this engagement, but it so happened that a group of the Pharisees, knowing that Jesus was on the opposite side of the lake in Philip's domains, decided to call upon Mary to learn what they could of his whereabouts. The arrival of these Jerusalem emissaries greatly perturbed Mary, and noting the tension and nervousness of the entire family, they concluded that Jesus must have been expected to pay them a visit. Accordingly they installed themselves in Mary's home and, after summoning reinforcements, waited patiently for Jesus' arrival. And this, of course, effectively prevented any of the family from attempting to keep their appointment with Jesus. 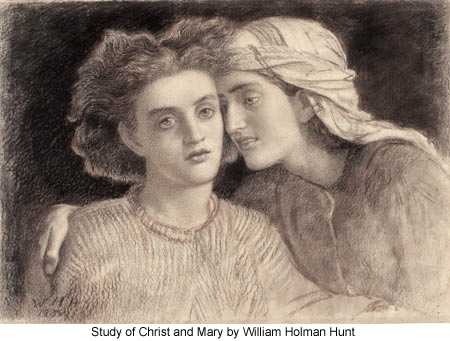 Several times during the day both Jude and Ruth endeavored to elude the vigilance of the Pharisees in their efforts to send word to Jesus, but it was of no avail. Jesus' brothers James and Jude had talked about going down to John for baptism; and now that Jude had come over to Capernaum for the Sabbath services, both he and James, after listening to Jesus' discourse in the synagogue, decided to take counsel with him concerning their plans. This was on Saturday night, January 12, A.D. Jesus requested that they postpone the discussion until the following day, when he would give them his answer. He slept very little that night, being in close communion with the Father in heaven. He had arranged to have noontime lunch with his brothers and to advise them concerning baptism by John. That Sunday morning Jesus was working as usual in the boatshop. James and Jude had arrived with the lunch and were waiting in the lumber room for him, as it was not yet time for the midday recess, and they knew that Jesus was very regular about such matters. Just before the noon rest, Jesus laid down his tools, removed his work apron, and merely announced to the three workmen in the room with him, "My hour has come." He went out to his brothers James and Jude, repeating, "My hour has come—let us go to John." And they started immediately for Pella, eating their lunch as they journeyed. This was on Sunday, January 13. They tarried for the night in the Jordan valley and arrived on the scene of John's baptizing about noon of the next day. John had just begun baptizing the candidates for the day. Scores of repentants were standing in line awaiting their turn when Jesus and his two brothers took up their positions in this line of earnest men and women who had become believers in John's preaching of the coming kingdom. John had been inquiring about Jesus of Zebedee's sons. He had heard of Jesus' remarks concerning his preaching, and he was day by day expecting to see him arrive on the scene, but he had not expected to greet him in the line of baptismal candidates. Being engrossed with the details of rapidly baptizing such a large number of converts, John did not look up to see Jesus until the Son of Man stood in his immediate presence. When John recognized Jesus, the ceremonies were halted for a moment while he greeted his cousin in the flesh and asked, "But why do you come down into the water to greet me?" And Jesus answered, "To be subject to your baptism." John replied: "But I have need to be baptized by you. Why do you come to me?" And Jesus whispered to John: "Bear with me now, for it becomes us to set this example for my brothers standing here with me, and that the people may know that my hour has come." After preaching the sermon on "The Kingdom," Jesus called the six apostles together that afternoon and began to disclose his plans for visiting the cities around and about the Sea of Galilee. His brothers James and Jude were very much hurt because they were not called to this conference. Up to this time they had regarded themselves as belonging to Jesus' inner circle of associates. But Jesus planned to have no close relatives as members of this corps of apostolic directors of the kingdom. This failure to include James and Jude among the chosen few, together with his apparent aloofness from his mother ever since the experience at Cana, was the starting point of an ever-widening gulf between Jesus and his family. This situation continued throughout his public ministry—they very nearly rejected him—and these differences were not fully removed until after his death and resurrection. His mother constantly wavered between attitudes of fluctuating faith and hope, and increasing emotions of disappointment, humiliation, and despair. Only Ruth, the youngest, remained unswervingly loyal to her father-brother. The third appearance occurred about noon of this Sunday at Bethany. Shortly after noontide, Jesus' oldest brother, James, was standing in the garden of Lazarus before the empty tomb of the resurrected brother of Martha and Mary, turning over in his mind the news brought to them about one hour previously by the messenger of David. James had always inclined to believe in his eldest brother's mission on earth, but he had long since lost contact with Jesus' work and had drifted into grave doubting regarding the later claims of the apostles that Jesus was the Messiah. The whole family was startled and well-nigh confounded by the news brought by the messenger. Even as James stood before Lazarus's empty tomb, Mary Magdalene arrived on the scene and was excitedly relating to the family her experiences of the early morning hours at the tomb of Joseph. Before she had finished, David Zebedee and his mother arrived. Ruth, of course, believed the report, and so did Jude after he had talked with David and Salome. In the meantime, as they looked for James and before they found him, while he stood there in the garden near the tomb, he became aware of a near-by presence, as if someone had touched him on the shoulder; and when he turned to look, he beheld the gradual appearance of a strange form by his side. He was too much amazed to speak and too frightened to flee. And then the strange form spoke, saying: "James, I come to call you to the service of the kingdom. Join earnest hands with your brethren and follow after me." When James heard his name spoken, he knew that it was his eldest brother, Jesus, who had addressed him. They all had more or less difficulty in recognizing the morontia form of the Master, but few of them had any trouble recognizing his voice or otherwise identifying his charming personality when he once began to communicate with them. When James perceived that Jesus was addressing him, he started to fall to his knees, exclaiming, "My father and my brother," but Jesus bade him stand while he spoke with him. And they walked through the garden and talked for almost three minutes; talked over experiences of former days and forecast the events of the near future. As they neared the house, Jesus said, "Farewell, James, until I greet you all together."